Prescription lenses from: Essilor, and AO Sola Zeiss. Our prescription lenses are used to treat myopia (near sightedness), hyperopia (far sightedness), astigmatism and presbyopia. Lenses were originally made from glass but now are made from plastic materials to lower the danger of breakage and take advantage of the lower weight. We also offer Polycarbonate lenses, which are the lightest and most shatterproof. We carry frames from Easy Clip, Inspira, Miracolo as well as our designer brands. 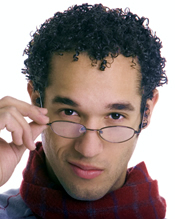 Glasses frames are commonly made from metal, horn and plastic. We also carry frames made from Titanium, stainless steel, plastic (acetate) and aluminum. 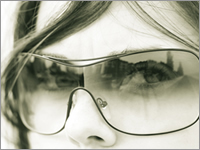 Anti-reflective coatings help make the eye more visible. They also help lessen back reflections of the white of the eye as well as bight objects behind the person wearing glasses. At night, the coating helps reduce glare from headlights of oncoming cars, making it an essential for driving. A UV coating reduces the transmission of UV light radiation. UV radiation increases the likelihood of cataracts, and can even damage the retina if exposed long term. DNA damage from UV light is cumulative and irreversible. 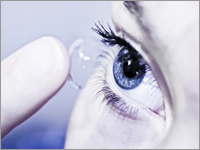 Soft contact lenses from Johnson and Johnson, Ciba Vision, Cooper, Bausch & Lomb, and Hydrogel Vision. We provide, conventional, disposable, high oxygen, high water content, coloured, bifocal, and progressive contact lenses. Contact Lens is a corrective, cosmetic or therapeutic lens placed on the cornea of the eye. 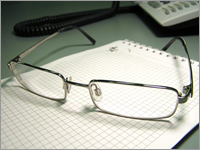 They are used for the same corrective purpose as glasses, but are ultra lightweight and virtually invisible. Contact lens are less affected by weather, do not steam up like glasses and have a wider filed of vision. 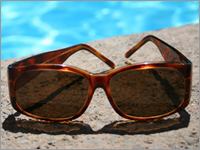 Prescription Sunglasses allow for better vision in bright daylight and may also protect from damage due to high levels of ultraviolet light. You should wear sunglasses whenever outside to protect your eyes from ultraviolet radiation, which can lead to the development of cataracts. Clip on Sunglasses, and custom made clip-on's are also available.